Project Run and Play: ZozoBugBaby Giveaway and This Week's Challenge! ZozoBugBaby Giveaway and This Week's Challenge! And now...for this week's challenge. I had a hard time coming up with a catchy or cute name for this week's challenge- it's the Adult Inspired Challenge! 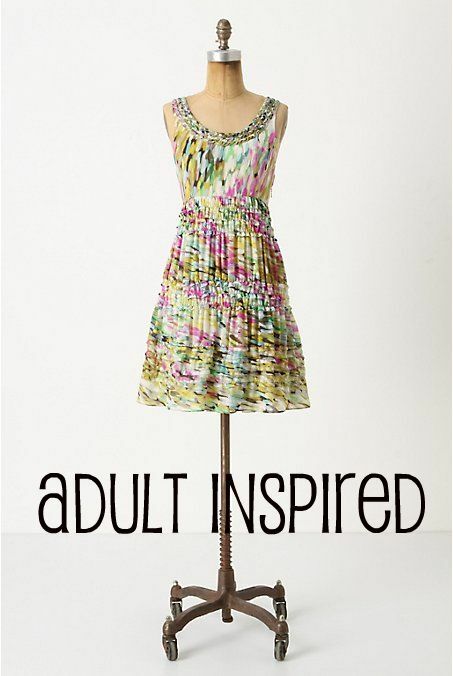 Find a designer, clothing brand, or style of adult's clothing, and reinterpret it for a child. 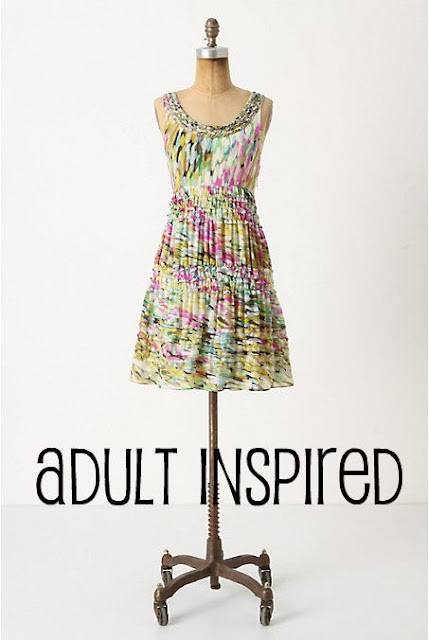 (The dress in the challenge photo from Anthropologie would be darling as a little girl's dress for instance). This might be my favorite challenge- there is so much inspiration everywhere! Have fun and don't forget to leave a link to your designs! I would like to apologize to the mama's of boys out there for our lack of boy's clothing. It's not necessarily that this is supposed to be strictly little girl's fashion, but they tend to be the most fun to design for. Hopefully our designers will include some boy's styles in weeks to come, and I'll try to feature some more boy-related styles if I can. Thanks for sticking with us! Also- I'm working on getting the results together for this week. I apologize for the lateness! I am digging the Maylia dress pattern but they are all so cute. either Izzy Bo Bizzy or Little Bow Chic, I can't quite decide! They are all cute!! But I think I would like to try the Maylia dress!! I love a lot of them but id I "HAD" to choose just one it would be the Maylia. Love the 2-in-1 POSEY and LOLA Dresses! I love the Izzy Bo Bizzy pattern. I LOVE this challenge! That's one of my FAVORITE things to do! I can't wait to see what they come up with. That Stella dress is adorable!! And I'm totally going to have to squeeze in another project on top of my Project Toddler Runway entry to link up to this challenge. So many ideas for this in my inspiration file, love it! I really like the charolotte knit and ruffle capri pants. They look so comfy and stylish. They are all so cute! I think my fave is the Little Bow Chic -love the back details! They are all adorable, but I love the Lola dress pattern! I'm loving that Izzy Bo Bizzy top! I love that maliya dress! They are all so cute, it's hard to pick. Love the Little Bow Chic Dress, so I'll go with that. Love the Bow Chic dress! I love the Maliya Dress. I could make 10 of them for my little girl and never get tired of it! I'm loving the Izzy Bo Bizzy Pop Top for my youngest, but think my eldest would die for the Stella dress! Just love that Izzy Bo Bizzy Pop Top. So cute and so many ways to insert great fabrics into the pattern. Great challenge this week! Love it! I have a few of their patterns already but would LOVE to get the Dee Dee Pop Dress...ADORABLE!!! Thanks!!! I would love to get my hands and sewing machine on the Izzy Bo Bizzy Pop Top and turn it into a dress...Thanks! All are so adorable! The one that stands out for me is The Tilt-a-Twirl pattern. Very Cute. The MALiYA Dress is adorable!!! I love the Zozo Tee Dress and the Georgia Dress! Just looked through all the great patterns, but I came back to the Izzy Bo Bizzy Pop Top. The doll bedding in your shop is cute too. Oh, and I am loving the Izzy Bo Bizzy top! I love the Izzy Bo Bizzy Top, so cute! I'd have to go with the Tee Dress! That Stella dress is too cute! the izzy is my fav! thx 4 the giveaway! The Izzy Bo Bizzy Pop Top is my favorite! I would take it just the way it is in the picture! Thanks for the giveaway! I'm so exciting about this week's challenge! Oh the Little Bow Chic dress is darling!! I can't decide between patterns.....oh the horror! I would say the Rosey Tilt a whirl, or the Zozo Tee dress..if I just had to choose...oh wait maybe the apron pattern.....oh I just am not able to commit! the Izzy Bo Bizzy Pop Top! I'm torn between the Stella dress & Izzy biz pop top! Cute patterns! I like the Little Bow Chic dress! That would be so adorable for the spring & summer! What a fun theme! I can't wait to see what everyone designs! love the dee dee pop pattern. I would love to make the Stella dress for my 18 month old daughter!! Very cute patterns. I choose the Tee Dress. Love it. Great patterns! My favourite pattern is the Izzy! Thank you for a chance! Little Bow Chic is soooo cute! I love the Georgia Dress pattern. Gee, not sure which I like the most! All so colourful, makes for a fun day out methinks! As a beginner sewer, I'd have a go at the Izzy Bo Bizzy Pop top. The Little Bow Chic dress is also a standout! Georgia dress for me. Tho, they are all adorable. Picking one favorite is hard!! But I love the Little Bow Chic dress. So sweet and it would be perfect on my girls!! I LOVE "The Stella Dress AND The Dee Dee POP Dress"
I like the Lola and the Tee Dress. I do need to sew more often with knits for the comfort of the kiddies. Although there were quite a few really cute items which made it HARD to choose, my favorite was the ZOZO TEE Dress pattern with the matching doll dress. So adorable! They are all so cute. My daughter would love to twirl around in the candy shoppe skirt. I really like the little tee dress too. They are all so cute- I think I like the Georgia dress best. My favorite is the The ZOZO TEE Dress + DOLL Dress pattern, all of them are so cute though!! All of her patterns are adorable!! I love the Posey and Lola dresses! All of the ZoZoBugBaby patterns are adorable. Living in the south, I think my daughter would love the Little Bow Chic Dress. I hope I win. And the Izzy Bo Bizzy is darn cute.. I like the stella dress. It's really cute! I really love the Stella - and that is one of my daughters names! the Izzy Bo Bizzy Pop Top! In love! I like the Lola and Posey dress pattern. I like the Stella/Dee combo OR the Georgia. Tough call! I love the Izzy Bo Bizzy Pop Top! I want to get that for my little girl! I love the zozo dress! Its so cute!! Here's my challenge for the week, and it's for a boy! It's got to be the Posey and Lola dress combo for me. Looking forward to this week's challenge items. I really like them all but my favorite is the Izzy Bo Bizzy Pop Top. It's so playful and fun! I like the dee dee pop dress.